I'd been lusting after one of these for a while, and this one came up cheaply on EBay, so I made my move! It only required painting (no original paint left), polishing and, as I discovered on the first run, the cylinder needed soldering back onto the block. The driveshaft had at some point been shortened so the flywheel only fitted reversed, and as the bearing points were pretty worn anyway, I decided to make a new driveshaft. I'm particularly keen on this engine, as it is the last British vertical. They were made between 1946 and 1949 by Burnac Ltd of Burslem, Stoke-on-Trent. It has a centre flue and speed control via a choke wheel on the exhaust - this works remarkably well, you can throttle the engine right down, and it will still run steadily, with a lovely little "chuff". Basil Harley makes an interesting observation in Toyshop Steam, that the "red painted flywheel and green base were typical of the colours in which most British toys were finished, reflecting standard engineering practice dating back many years into the 19th century"
The engine stands on a heavy Mazak (MAgnesium, Zinc, Aluminium, Copper: commonly used for diecasting) base, and is steady as a rock. It is fired by a small twin wick spirit burner. It really is quite small, 23 cm / 9 inches from base to top of chimney, but remarkably heavy for it's size - the boiler is thick brass, and the quality of the engineering, as in all toys of that time, is outstanding. It runs well, if not exactly powerfully, and remarkably effectively. At the end of the day, this is another example of one of those rare engines where everything just came together nicely, and made a very pleasing little package. Apparently approx. 30000 of these engines were made, and a fair few survive - they come up every now and then, and I heartily recommend you grab one while they are affordable! Another nice example of this engine can be seen on John Chapman's pages. John O'Rear makes an interesting observation: that the sight glass is very similar or identical to that on Bing engines. I suppose it is possible that Burnac managed to get hold of a job lot of sight glasses from the then defunct Gebr.Bing (Bing went under in the 1930s, as a combined result of the economic recession and the rise of antisemitism - most of the big German modelmakers were Jewish. Bing survived briefly in postwar America - I do not know what happened to the Bing brothers of Nuremberg, although it probably does not take much imagination to guess their fate). This handsome little engine now graces my collection thanks to John Chapman, one of the true gentlemen of steam toy collecting. These engines come up quite frequently, and are always snapped up, and rightly so because in my opinion they're lovely things. SEL (Signalling Equipment Ltd. a subsidiary of J & L Randall Ltd, toys and games makers of Potters Bar), made these engines between 1946 and 1965, and were considered the most successful of Mamod's competitors. This engine, the middle of the range model 1540, is perhaps the most succesful one. They also made the No.1520 (Minor), the No.1530 (Junior) and the twin cylinder No.1550 (Major). These are tiny engines, smaller even than a Mamod minor, but they're very well engineered. This one's a superb little runner, it cranks up some very high revs. It came to me in pretty good condition, just needed a bit of tidying - SEL at one point decided to spray their boilers gold, and the paint hardly ever survives in a presentable state, so I stripped the boiler back to brass. Also worth noting that the engine stand is actually Bakelite. The bearing hole on this one was badly run out, so I fitted a little 5/32"(OD) brass bush to improve things. You'll also notice that this engine has a rudimentary displacement lubricator - as the piston/cylinder are so tiny, lubrication is essential. The base was at some point repainted in a rather lurid green, so I stripped it down and resprayed it. This engine came with a badly damaged box - I managed to preserve the inner and the two main labels. This box is plain brown with black printing, dating this engine as an early one - later boxes are much more colourful. I'm very pleased with this engine, as it fits precisely in the time and style bracket I'm interested in - you can see clear similarities between this one, the Burnac and the Bowman Luton, for example. 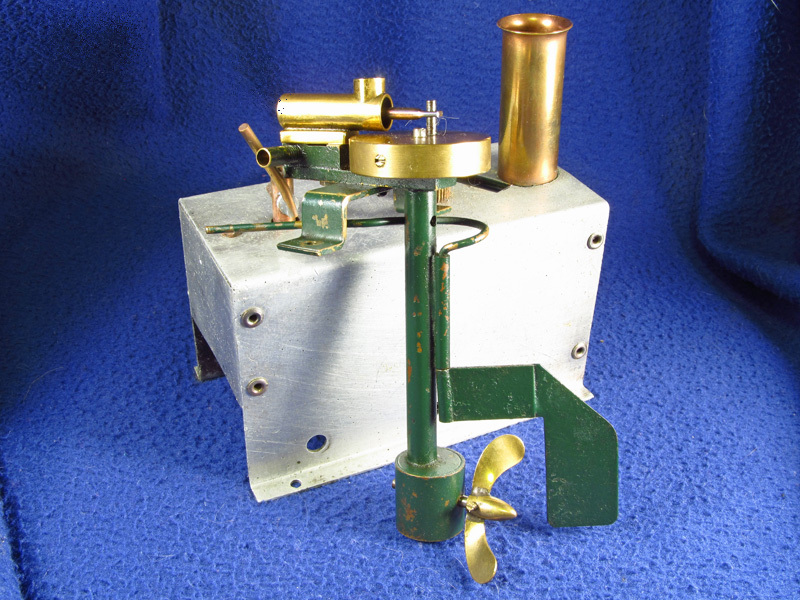 "In 1932, towards the end of its long life, the Clyde Model Dockyard marketed this curious steam outboard-engine with an aluminium cased boiler. It was sold for fitting into customers' own hulls"
The Clyde Model Dockyard was one of the oldest model merchants in Britain - they were established in 1789, and originally made nautical models for the Admiralty. 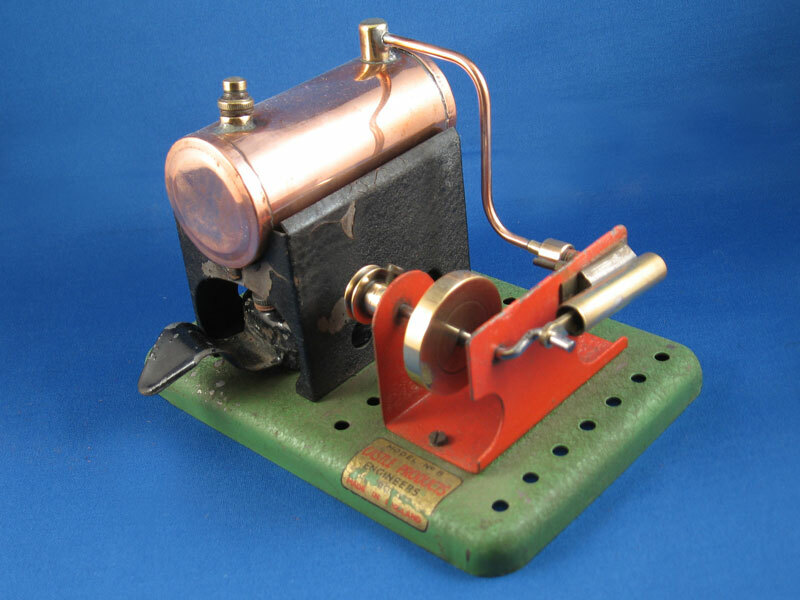 In the 1880s the went into model steam engine production, making stationary engines, O gauge locomotives and, last of all, this little engine. 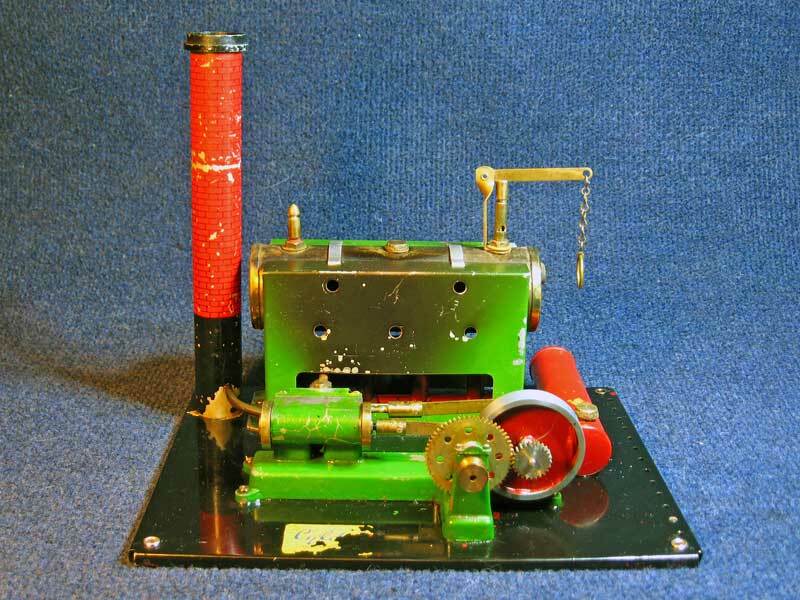 This manufacturer is often mentioned along with Steven's Model Dockyard and the Original Model Dockyard - they form the three earliest toy steam engine merchants. So, this little engine is the closing chapter in the history of a very venerable company, and I am delighted to have it in my possession. Given its rarity, I will preserve rather than restore, but this engine is in full running order and it will be used. So how did it get to me? Just like my Mersey 52r it came from Jon Penn, who hereby is elevated to superhero. After I bought the Mersey he and I got chatting, and he said he had something I'd like....did I ever, especially given that it was mounted on a rather nice old hull, and even had a perfectly functional little Mamod boiler and burner with it. At the time, I'd just finished building my Arrow so I was skint, but Jon was kind enough to hold it for me for several months. Not that he wanted much for it....Jon's a decent human being, and much more interested in sending an engine to a good home than making a huge profit. Postscript June 2010: I was lucky enough to find the original boiler for this engine as well! I was working away from base, doing a recording in Cowbridge, a genteel little town in the Vale of Glamorgan. On a break I decided to take a stroll into town, and stumbled across one of these antiques emporiums, you know the kind, lots of different traders in one shop, mainly stuffed animals and oil paintings. I had a rather despondent little mooch, and spotted a cabinet with some Hornby stuff. Half hidden under a stack of magazines I noticed a familiar perforated base.....another look, and suddenly my palms got rather sweaty....I called over the proprietor, inquired after a price, to which the response was "ï¿½25, but you can have it for ï¿½20".....quick as a flash my wallet came out and a very short while later Mooseman was seen dancing down the streets of Cowbridge, making strange little whooping noises. 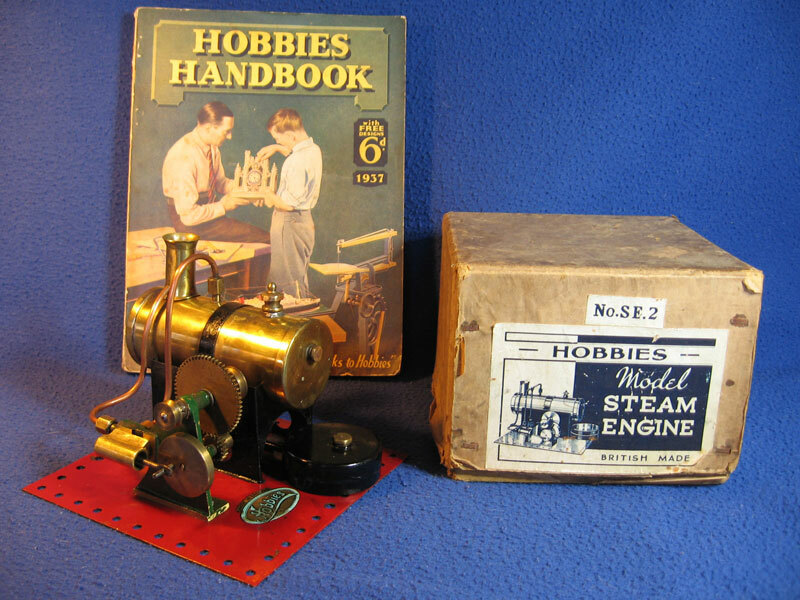 This is of course a Hobbies SE2...made by Geoffrey Malins, before the Mamod brand name, for Hobbies. Hobbies at that time was trying out Malins as a supplier because Geoffrey Bowman-Jenkins had stopped making the "Bowman" brand of engines....the 1937 Hobbies Handbook (separate purchase) shown in the background shows both Malins and Bowman engines, but all are sold under the Hobbies brand. 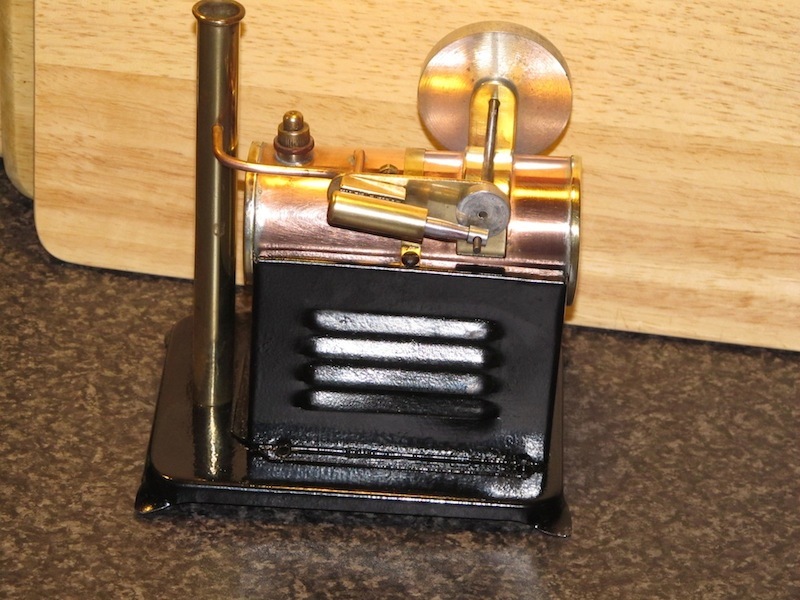 This little engine is in superlative condition....it is very complete, the box is relatively undamaged, burner's there, and the decal's near perfect. Only detracting factors are that the safety valve is a little damaged and firebox have been repainted in a very dim and distant past....I expect by a previous owner, who has left his name in faint pencil on top of the box: "Alan Wood, 40 Albert St., Warwick"..... was this the first owner? Can't help but wonder what became of him. It is of course worth rather more than 20 quid....it's an important little engine, because it marks the end of the dominance of Bowman, and the beginning of Mamod, as the market leaders in toy steam. I do like it very, very much indeed....it is almost a perfect cross between a Mamod and a Bowman, and very close to what I would call a perfectly designed engine. Does it run, I hear you ask? Well, I have not come across a British engine from this era yet that doesn't run, and this little beauty is no exception! Very little is known about Wilson Bros. of Liverpool - they only ever made these two engines, around 1948. 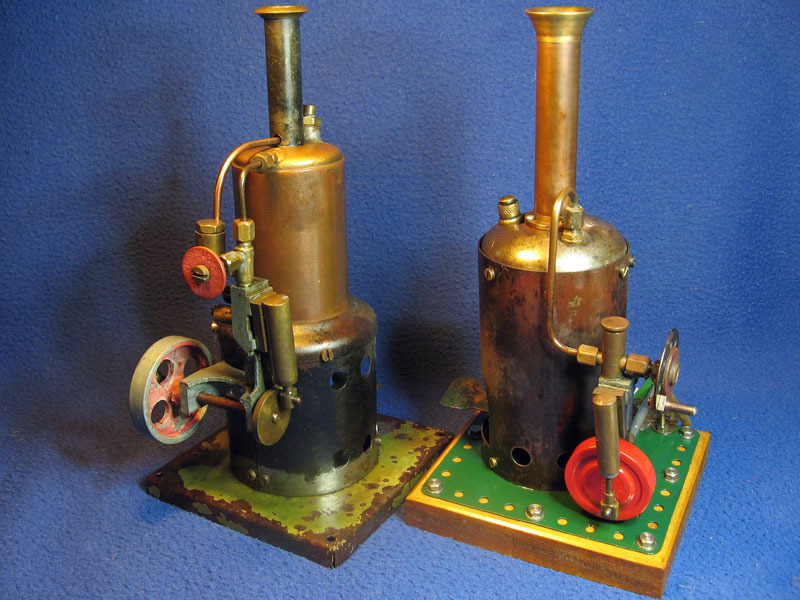 The one on the left is the larger engine, and has a flue type boiler, the one on the right has a small brass flue boiler contained in a steel shroud. Both engines incorporate displacement lubricators, and therefore run very well - not a great deal of wear and tear on the pistons and cylinders. Engine frame and flywheel are mazak, and as these are mounted directly to the boiler on the larger enginethe whole assembly gets very very hot indeed during a run - the wooden disc on the steam valve (original feature) is no unnecessary luxury. The large engine is in original, unrestored but fully working order, whereas the small one has been partially restored by a previous owner, to quite a decent standard. These engines are now getting very hard to find, and I'm very chuffed indeed to have them both in my collection. Below is a little video, with commentary. Again, very little is known about this engine...it's a "Careast", ca.1946, and all I know is that I've wanted one ever since I first saw one some seven years ago, an ambition finally fulfilled with the help of MFSteam. This is a very massive, large and heavy engine - a chunky single cylinder engine drives twin flywheels...the spent steam exhausts into the stack, which in turn leads straight into the firebox, so the odd drop of oily water lands on the massive three wick burner with most satisying spitting, hissing and oily smells....a real engine lover's engine. Not a tearaway runner, but it will run at a steady pace for absolutely ages, and with judicious use of the steam valve can be slowed down to a lovely tickover. In the years prior to the Second World War Sydney S. Bird and Sons, of Enfield, Middlesex, UK, was a manufacturer of radio components. The companyï¿½s products were marketed under the trade name of "Cyldon", this name being derived from the Christian names of Sydney Bird's two sons Cyril and DonaldIn early 1947 they decided to diversify and started producing toys. Their first product was a construction set, similar to "Meccano", which they called "Prestacon". This was followed by a range of toy cookers, sewing machines and steam engines. 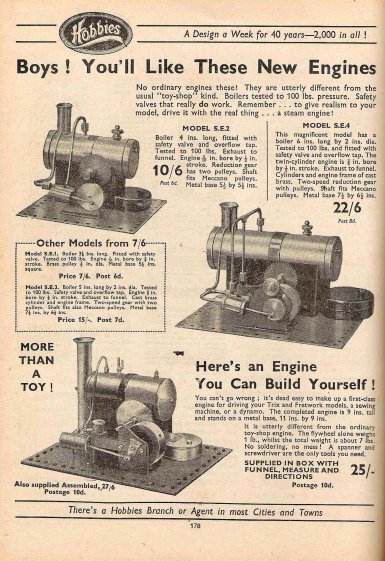 In the book "Toyshop Steam" the engines were incorrectly attributed to "Rees and Company". This is because they were marketed by the wholesaler Leon Rees of London. 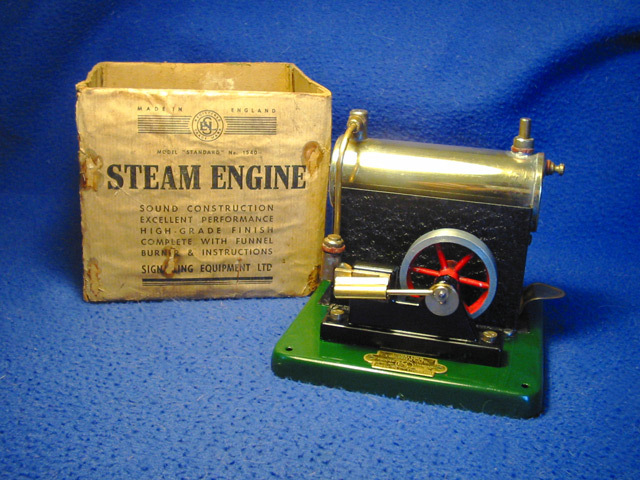 Production of steam engines lasted until around 1951 when there was an upturn in the electrical component market related to the increase in the sales of televisions. 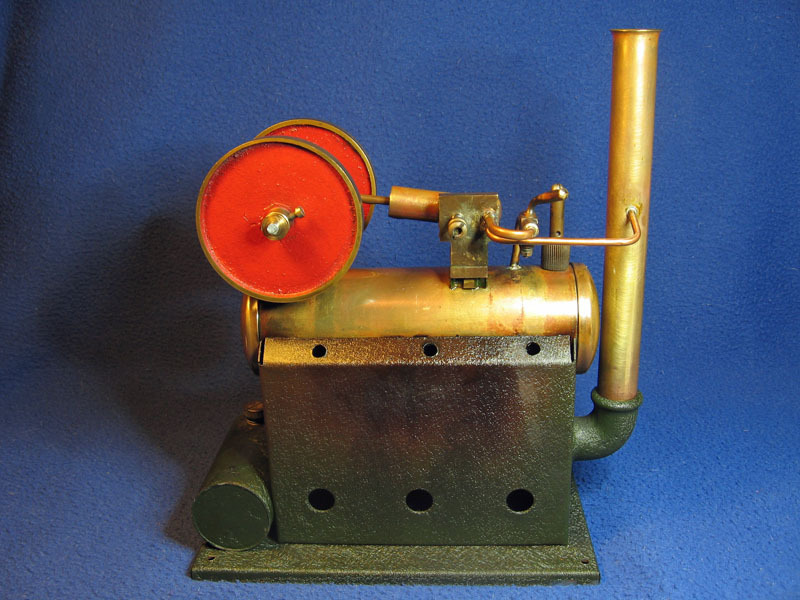 They made an interesting range of steam engines, including a very intriguing semi-rotative valve model. 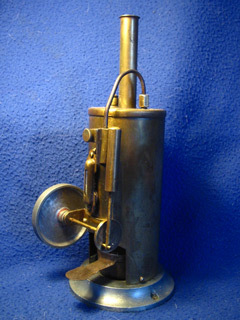 This model I find the most appealing: it is a proper slide valve engine. It is a lot smaller than it appears, the footprint is about the size of a medium-size mamod, but it packs in an awful lot, and it is very well designed! For example, the large three wick burner is held in place by a couple of bolts through the plate, preventing it from vibrating loose. I was very pleased to find this engine at a reasonable proce, and even more pleased when the seller informed me he'd found the original box as well! I love the way it looks, I will carry out no restoration on this engine. It runs very well, as can be seen in this video. I know very little about these - British made, 1950s, very simple, but well built. The design and paintjob ticks all my boxes, and it doesn't half run well! More than a hint of SEL about it, but a much larger piston/cylinder and consequently a lot more power. I know absolutely nothing about this brand, other than that it is a commercial product and postwar British. When I got this engine, the boiler shell had suffered terrible fatigue cracking, so I had to replace it, but the rest of the engine remains original. I particularly like the louvered firebox. 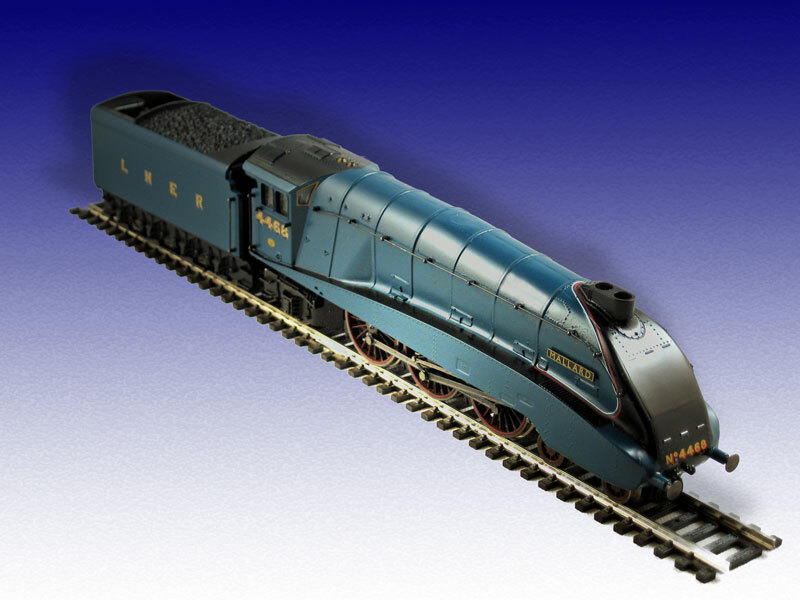 Hornby 00 Gauge Live Steam "Mallard"
Although this looks like your typical (albeit exceedingly nicely detailed) Hornby electric 00 gauge loco, this is indeed a live steam engine! 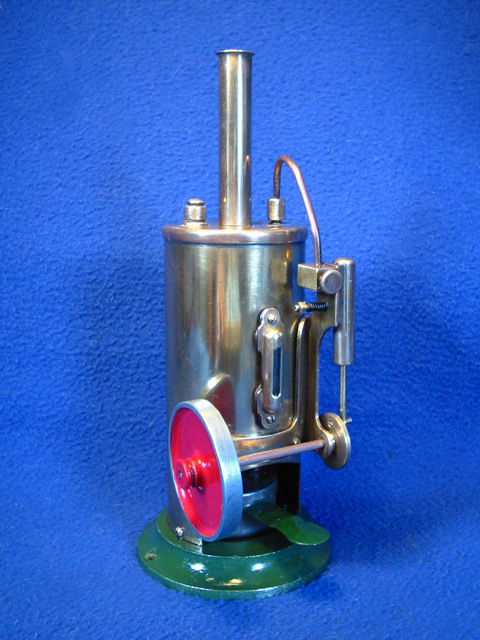 The tender contains a small boiler, which drives a twin cylinder rotating valve engine - the steam passes through a superheater in the loco, and speed, direction and whistle (!) are controlled by a beautifully made transformer/controller pair. The heater operates on 10 to 15 volts DC depending on 1 of 3 settings, and the servo which controls the valve is controlled by a lever on the controler, which sends an electric pulse down the track.This takes a little while to master, but is remarkably effective, and the loco runs beautifully, especially when pulling a rake of coacjes. This set was introduced in 2004, and is still available....it now costs around ï¿½400, too much for me, but this one came up on eBay at a very affordable price. I like it very much indeed. Below are a few videos.